It’s been said each American city has a unique personality: Chicago has Broad Shoulders, New York, the Great White Way. Certainly, Cleveland has its own personality, but it also strives constantly to define and redefine its place in American culture. When you come right down to it, our town is really nothing more then the sum total of the hopes, wants and dreams of its people. That’s why this book is not about Cleveland, but rather the people who define our town. They are a diverse group, as diverse as our town. Some you’ll know right away, others you may not even know. They include world class athletes, entertainers, musicians, artists, and civic, business and religious leaders. Many have helped shape our local and even national culture. Others work behind the scenes to improve daily lives on a very basic level. You may work with some of them, hear them on the radio, or see them on TV. You may worship with them on Sunday, see them out and about on the town, or bump into them at the local grocery store. Some grew up here, some traveled half way across the world to get here, others got their start here. But consider them all our neighbors. They all hold a special place in their hearts for our city, their home. Books are available at Barnes and Noble, Borders or by contacting us here at Lorien Studio. 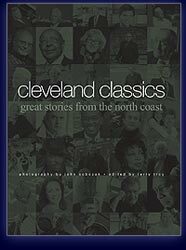 "A genuinely beautiful book visually, it's written pieces are thoughtful and entertaining"
"Cleveland Classics captures a nostalgic, yet surprisingly fresh view of our city in the words of notable characters who have called it home."